The new Davidoff Blend Collection which begins with fragrance DAVIDOFF LEATHER BLEND is inspired by the curiosity of Zino Davodoff who was discovering the world and the best materials and skills in creation. His passion for discoveries, uncompromised quality and elegance resulted in the new collection which would offer the best and rarest raw ingredients combined with style and packaged in an elegant and luxurious way. DAVIDOFF LEATHER BLEND is the first in a line of fragrances based on special notes and celebrates precious leather. The competition is signed by perfumer Christophe Raynaud, who provided it with spicy-oriental character. Top notes emphasize spicy flavors of saffron and stimulating cold black pepper. The heart incorporates warm scents of rose with shades of hot amber, while the base features precious, masculine leather leaving an irresistible musky trail. 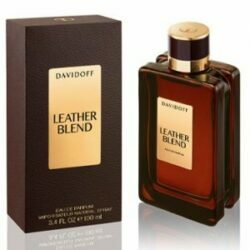 Davidoff Leather Blend can be purchased as 100 ml Eau de Parfum. The flacon is made of heavy glass in dark brown color, with a metallic plate inscribed with the name of the brand and the fragrance. The outer packaging is also of dark brown color with golden color details, made of robust, rough material. Davidoff Leather Blend was launched in 2014.